Over the course of four hours on November 30, 1999, Seattle witnessed the results of months of organizing by organized labor. As many as 35,000 people filled a football stadium and took over miles of downtown Seattle streets. The event sent an unmistakable message to its target, the World Trade Organization. The day began with a morning rally, in which some 20,000 people packed into Seattle Center's Memorial Stadium to shout unequivocal disapproval of the World Trade Organization. Union members from more than 144 countries were present, many of them having attended an international labor conference in Seattle the week before. Source | WTO History Project, "March featuring the International Brotherhood of Teamsters contingent," photograph (Seattle: University of Washington Libraries, Special Collections Division, 20 November 1999), http://depts.washington.edu/wtohist/collection.htm. 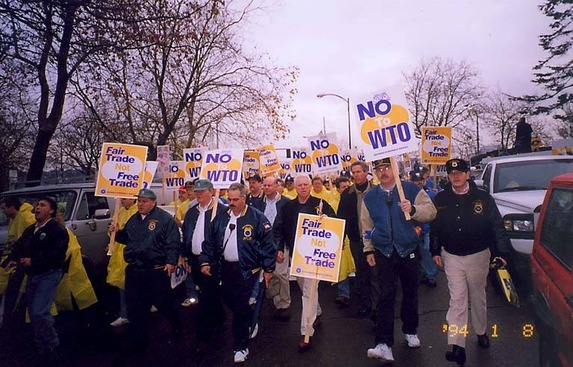 Cite This document | WTO History Project, “Teamsters Protest the World Trade Organization,” HERB: Resources for Teachers, accessed April 21, 2019, https://herb.ashp.cuny.edu/items/show/1051.